We will answer frequently asked questions as they come in. Please refer to the help page for a demonstration of how to use the kiosk and other features. FAQ: I exchanged points for a coupon code but where is it ? It only displays "Exchanged!". Answer: If your pop-up blocker is set to on, then this will block the window with the coupon code. We are working on fix for this. Please call or e-mail us 650-520-8540 or support@touchscreendvds.com for your exchanged coupon code. FAQ: I just signed up with your site, and I have negative credits. Answer: This usually occurs when you sign up for the mailing list and newsletter which gives bonus points. If you then unsubscribe you lose those points and go into a negative balance. FAQ: How long can I have a movie ? Answer: You have 14 full days to return the movie. On the 15th day you are charged the sale price of the movie. FAQ: I didn't want the movie I rented. Can I return it without being charged ? Answer: Yes, you have 10 minutes to return the rental and not be charged for it. FAQ: Is there a Spanish language option when renting ? Answer: Yes. It is on the bottom of the screen. Simply press it and the language will change to Spanish. FAQ: Can I return my rental at RedBox ? Answer: No. We are not part of RedBox or associated with them. 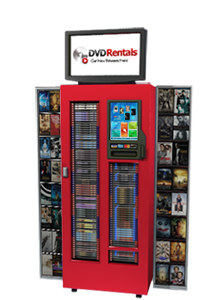 Please return your rental to one of our locations so you are not charged the sale price of the movie. FAQ: Who do I contact if a problem occurs ? Answer: Please contact us if you have any questions or issues at (650) 520-8540 or support@touchscreendvds.com.